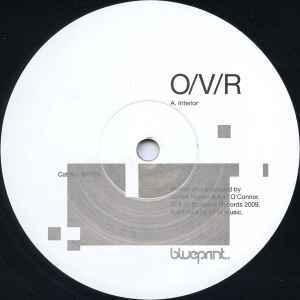 ℗ & © Blueprint Records 2009. Side A plays at 45 rpm, side B at 33⅓ rpm. England's heavy weight heroes join forces for a combined release. While I would have prefered if they made a release together about a decade ago, "Interior" sounds fresh nonetheless. The title track, despite the overall pulsating minimal drive, has these far out sounds and outbursts of static effects throughout the background, along the lines of 2007's "Ugandan Speed Trials" release on Downwards (DN4). While not as hard and monotonous as a lot of work Regis and Ruskin got known for, this still remains head and shoulders above state of the art techno music. It's not afraid to explore the more sinister side of the rainy country's scene and deliver something more than the same old clicks clacks over and over again. Sure all three tracks sound very similar to each other, but I doubt you'll mind that. Bottom line is that James Ruskin proves yet again that he is at the top of his game (especially after last year's brilliant album "The Dash"), while Regis is slowly reinventing his style, as already showed on his appearances on Sandwell District and the releases "Radical Simple Practice" and "Mad Oput - 1/2" on his own Downwards imprint.